is one of the best and tastiest ways of doing so! Read more below to find out the specifics of joining our CSA. We are taking names for shares in our next beef. It will be divided into eight equal shares. The total weight of each share will vary depending on the live weight of the animal, but we expect it to range anywhere from 40-55 lbs. The cost will be $9.75/lb of cuts. Once 6 out of the 8 shares are spoken for we will request deposits from the families splitting the beef, and get started on the butchering process. 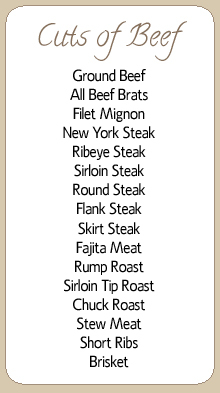 Simply fill out our Beef Share Form and we will put you on the list. Please only join the list if you are committed to purchasing a 1/8 share. Wait times will vary depending on how many other families are ready to purchase beef. It could be 1-2 months before enough people are ready, and then it will be an additional 4-6 weeks before the beef gets to you. We will do our very best to keep you updated once you are committed. You do not need to pay at this time. We will send you a deposit request when the beef is ready to go to butcher. We now deliver our CSA shares! No more pickup locations. Read on for more detailed information. How do I become a member of Green Beef CSA? You can sign up for a share of our grassfed and grass finished beef using our Beef Share Form	by clicking the link to the right. The form lists available pickup options and times. We realize that for some of our existing CSA members, this new method of splitting up the beef might be a big change since you will be picking up 40-55lbs of beef at one time. You might be worried that you will not have room in your freezer. We have a couple ideas for you if you are worried about this. The Home Depot carries a nice 3.8 cu. ft. chest freezer for $100. This would be a good option for a 1/8 share of Green Beef. Another option would be to split your 1/8 share with family or friends. You would be responsible for paying for the share and picking up the meat, and you would be responsible for distributing it amongst your friends. Keep in mind that one beef usually yields about 55-60% ground beef. Thank you for your continued support of Green Beef and 7 Springs Farm. The cost per pound of beef is $9.75. Since we are splitting a beef into eighths, the exact price for your meat will vary every time since every animal is different. It could be anywhere from $390 to $540. Once we have 6 out of the 8 spots filled, we will begin the butchering process. It is at that time that we will request a deposit from all of the members for that beef. There will be a $300 deposit due before butcher. The remainder will be calculated and due upon pickup approximately 4-6 weeks later. We accept payment through PayPal on our website below. We can accept a check, cash, or a credit card at your pickup. Please do not make a payment below until we have filled the shares of a beef and let you know it is time to pay your deposit. We are now delivering our CSA shares! We will stay in contact via email with you after the butcher date has been set and you have paid your deposit. We will let you know when the meat is expected to arrive in San Diego, and schedule a time for us to meet you for delivery. We have been raising pastured pork on our farm for the last couple of years. It is a tasty addition to our pastured meats! The pork membership consists of a 1/4 share of pork. It will work just like our 1/8 share of beef that we talked about on higher up on this page. The cost is $6.75 per pound for the pasturted pork membership. There is a $150 deposit that is due before butcher. The remainder will be calculated and due upon pickup approximately 4-6 weeks later. You will receive 1/4 of a hog in a combination of bacon, ham, ground pork, pork steaks, pork roasts, and pork chops. We provide the same high level of care for our hogs as we do for our cattle and sheep. How do I become a member of the Pastured Pork CSA? You can sign up for a 1/4 share of our pastured pork using our Pork Share Form. New laws were passed that require all meat for sale to list nutrition facts at the point of sale. Here are the links to the nutrition facts for beef and lamb. Please note that these are generic nutrition facts given to us by the USDA, and that these values were derived from meat where the animals were probably finished on corn.